Home Tags Articles tagged with "Steve Chestnut"
Maricopa Unified School District Superintendent Steve Chestnut’s early departure was approved Wednesday. His last day on the job will be March 9. The MUSD Governing Board met in a brief executive session with its attorney March 7 to discuss changes in Chestnut’s contract, which would have ended July 1. The board also approved Chestnut’s $5,000 performance pay as required by law. Chestnut requested he be released form his contract in early March to begin work at his new post. Scottsdale Unified School District hired Chestnut as its associate superintendent last month amid upheaval at that district’s highest level. His first day at SUSD will be March 12. Chestnut has worked for MUSD since 2012. In recent years, Chestnut was named a finalist in larger districts’ job searches but stayed on with MUSD after the interviews didn’t produce contract offers. MUSD’s decision last year to extend Chestnut’s contract only through July prompted a superintendent search that began in January. The Board is expected to interview six candidates March 13-14. The finalist will be announced March 26. During the brief vacancy, around 15 of Chestnut’s “broad range” responsibilities will be split between administration cabinet members, said MUSD Human Resources Director Tom Beckett. Beckett will also coordinate the Board’s meeting agendas. The board meets again March 28. The search is on for a new superintendent in the Maricopa Unified School District. Almost. If a search agreement is approved Wednesday night by the Governing Board, the district will pay the Arizona School Board Association $9,600 to assist in the hunt. The services provided by ASBA would “include up to seven pre- and post-hire meetings with the Board, ASBA administrative support, use of ASBA’s applicant tracking system, ASBA intellectual capital, and up to four finalist background checks,” according to district documents. MUSD has just over seven months to fill the leadership position before current Superintendent Steve Chestnut leaves the district. Whoever fills his shoes must begin work July 1, 2018. The district made its first step in the process in early November, when the Governing Board voted unanimously to hire ASBA. The decision was first discussed by the board in executive session during a board meeting Nov. 8. Assisting the district in narrowing down vendors – which ranged from MUSD’s own Human Resources department to large, national firms — was its legal rubric. Governing Board President Patti Coutré said the board’s evaluation favored ASBA. “They came out the highest scoring, and that’s why we chose them,” Coutré said earlier this month. After a three-week break from meetings, the board will return Wednesday evening to present an overview of the search process. The board was originally scheduled to discuss four other items relating to the superintendent search on its Nov. 29 agenda, but removed them Monday morning. Items removed included an online survey to collect opinions from the community, a discussion on the extent of stakeholder involvement in the search process, advertising materials and related content. Instead of getting ahead of itself, the district decided to amend its agenda once more Tuesday morning to include possibly approving an additional meeting in the future to continue the discussion beyond its regular meetings. After a discussion from an ASBA representative, “we thought it would be better for our board members to have more time to be fully prepared and a better use of time to wait,” Coutré said Tuesday afternoon. “After a second discussion, we thought of having a special board meeting for these items that would allow our board members to be prepared, and not wait for the next regular scheduled board meeting,” she added. MUSD will decide the date of that additional meeting Wednesday night, during which time the board will also consider talks with the Human Resources Department in a revision of its hourly wages for classified employees. Wednesday’s meeting starts at 6:30 p.m. at the District Office Administration Building, 44150 W. Maricopa-Casa Grande Hwy. The passage of the override and the retention of school staff were two of many deciding factors in a performance-pay plan awarded to the Maricopa Unified School District superintendent. Wednesday evening, the MUSD Governing Board awarded Steve Chestnut $7,700 for meeting specific goals in its strategic plan for the 2016-17 school year. “Knowing that we passed the override and this year we’ve had the least amount of teacher’s leaving, that tells you something,” Board member Torri Anderson said. Board members agreed the override allowed Chestnut to achieve certain strategies like improving relationships with stakeholders and legislators, among other accomplishments. Despite achievements, the board did not award Chestnut the full performance pay amounted negotiated in his contract. Board members could have awarded its superintendent $8,977, but chose the lesser amount because of goals they said Chestnut did not meet completely. Most of Wednesday’s discussion took place in closed session. “It’s not just one particular goal that he didn’t meet. It was bits and pieces of each of those strategies underneath those goals that we didn’t feel were fully achieved,” said Board President Patti Coutré. The MUSD Strategic Plan includes four overall goals with accompanying sub-strategies that provide a guide for the board to follow when negotiating the superintendent’s performance pay. Improve student learning and become an “A” rated school district with each school achieving an “A” grade. Increase and expand innovative opportunities. Recruit, train and retain a high-quality staff. As of now, MUSD is a B-rated school district based off student achievement, an area Chestnut said had room for improvement. 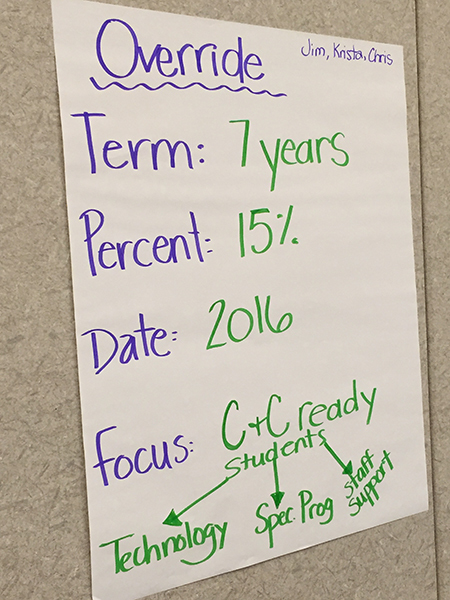 “Student achievement is our focus, it has been, and it will continue to be,” Chestnut said. Chestnut said the board is required under statute to evaluate him through a performance plan and subsequent pay based off of it. During the meeting, the board also voted to strike its private negotiation and possible renewal of Chestnut’s contract from its agenda due to the absence of the board’s attorney and two of its board members. Chestnut’s current contract ends in June 2018. Coutré said superintendents are permitted to initiate negotiations 15 months before a contract ends. “(The new contract) would start July of 2018 and it would go to whatever year we decide; that is what we are negotiating now — the detail on that,” Anderson said. The contract discussions will take place in executive session at the next board meeting in August. MUSD Superintendent Steve Chestnut sat down with InMaricopa for a Spotlight interview. Maricopa Unified School District superintendent Steve Chestnut came by our InMaricopa studio to discuss the potential override being proposed by the district, as well as issues with classroom ratios and district needs. Currently, the district still has open full-time teaching positions. The lack of teaching staff has created issues of overcrowding in classrooms. At the high school level, class sizes average more than 30 students per classroom. Overrides can only be voted on in a general election, and the committee hopes to have the new proposal on the ballot for the upcoming election in November 2016. MUSD Superintendent Steve Chestnut listens at a meeting of the Override Recommendation Committee. Override talk is heating up again. Maricopa Unified School District’s Override Recommendation Committee met twice in September. The governing board will see the resulting recommendations at its meeting Wednesday. It is on the agenda as an information item. The last election on a budget override proposal was in 2014. Maricopa voters rejected it by more than 700 votes. The district’s previous override of 10 percent expired in 2012. In his report to the board this week, Superintendent Steve Chestnut said the Override Recommendation Committee was tasked with determining whether to attempt another override and, if so, when and in what terms. “The general consensus from that meeting [Sept. 3] was that the term should be seven years for 15 percent,” he said. Whether such an election should be in 2016 or 2017 remained up in the air through the second meeting of the 12-person committee on Sept. 17. “The committee agreed that it would be worthwhile to discuss this issue with professional consultants to get their opinion on this issue,” Chestnut reported. The Override Recommendation Committee drew up some options for a possible budget override election. Chestnut said state funding for K-12 education has been cut 24 percent since 2008. He said Maricopa needs the budget override to provide more opportunities for students and to be competitive with other districts. Items suggested for budget-override funding include reducing class sizes, adding foreign languages and alleviating scheduled state cuts in Career and Technology Education courses. Override Recommendation Committee members are Chestnut, Scott Bartle, Patti Coutre, Chris Eldridge, Jerry Figgens, Jim Irving, Joshua Judd, Jeff Kramarczyk, Vincent Manfredi, Leon Potter and Henry Wade. The MUSD governing board meets at 6:30 p.m. Wednesday in the district office, 44150 W. Maricopa-Casa Grande Highway. Also to be discussed Wednesday are legal options the school district has for selling or leasing its property near the Global Water offices. Business Services Director Aron Rausch provided a memorandum in September outlining what MUSD may do with and without voter approval. Arizona Revised Statutes has stipulations on the sale or lease of school property and the use of any money arising from that action. “By law, a school district must obtain electorate approval before it can sell school sites,” Chestnut said. The property in question is 24 acres. A January estimate valued the property at $30,000 per acre, according to Land Advisers Incorporated. If the land were to sell for $720,000, Rausch estimated MUSD could put 62 percent into construction, improvement or furnishing of school facilities and the rest into reducing bonded debt. Members of the Override Recommendation Committee met twice in September to discuss the issues.